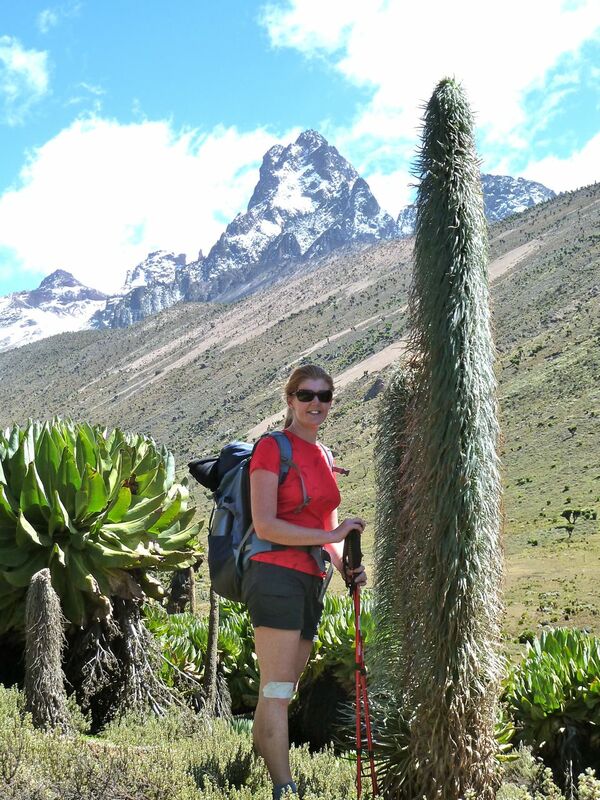 I can’t remember how many people told me I should do a practice before taking on Kilimanjaro. So from sea level in Ghana and a quick search on the internet I decided Mt Kenya would be a good trial climb. 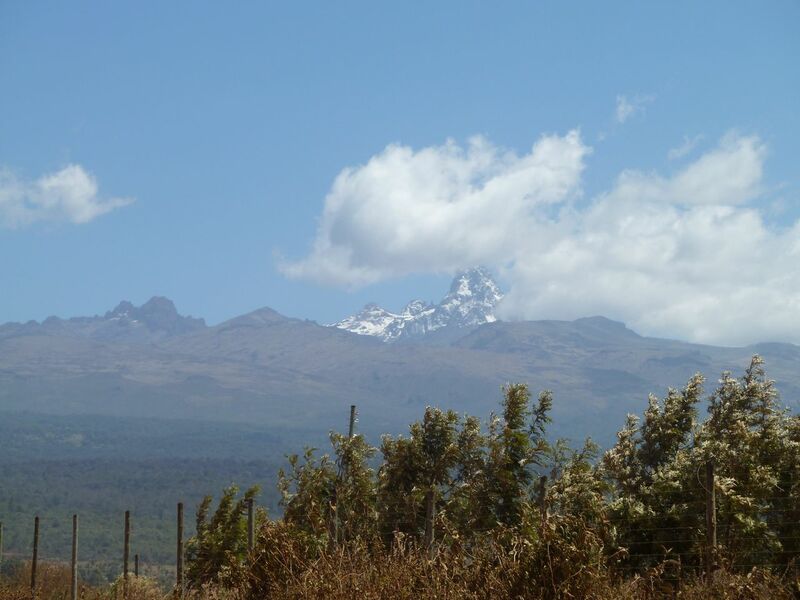 Kenya’s highest mountain, the second highest mountain in Africa and only 4 hours out of Nairobi… yep Mt Kenya would do. Checking out of my Nairobi hotel, I met a group of Middle Eastern men, all decked out in the same outfits and piling large blue duffle bags on top of a bus. They were off to climb Kilimanjaro and curious where I was going. 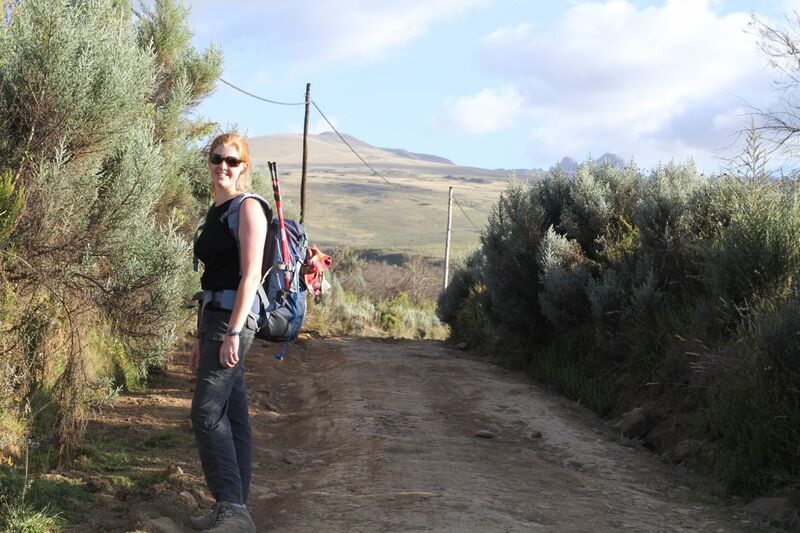 Travelling on your own as a white, redheaded female attracts attention in Africa and I’ve become quite good at cutting off the crazies. These guys weren’t crazy – but they thought I was! Apparently what I didn’t see in my research were the parts that say Mt Kenya is a much harder climb that Mt Kilimanjaro. 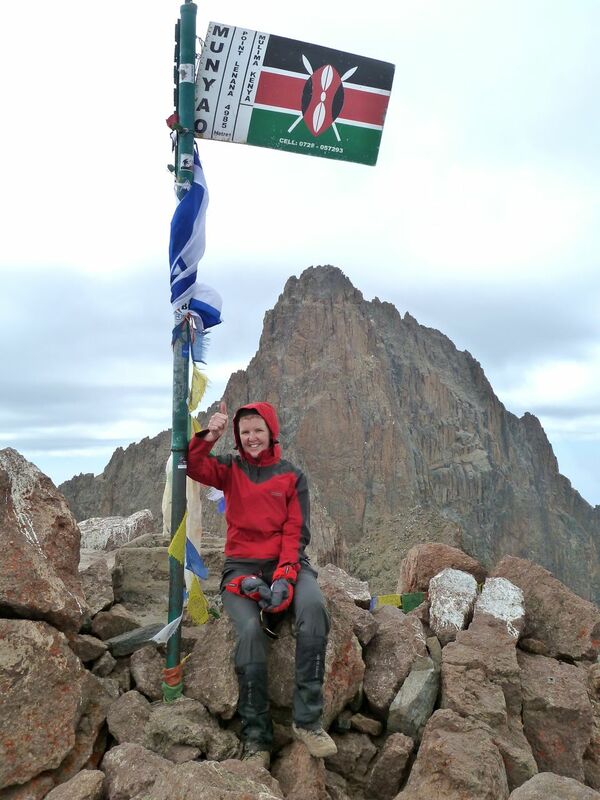 Only the third highest peak of Mt Kenya (Point Lenana) is accessible to trekkers – any higher and I’d need technical climbing and abseiling equipment. Reaching Point Lenana at 4985m in 3 days would be more than enough for me. When Joseph, the owner of the trekking company I was using, arrived to collect me (appropriately half an hour late by African standards) he concurred with the Middle Eastern men. I’m crazy. Joseph wasn’t going to talk either himself out of business or me out of the trip. So there was nothing left to do but pick up my 27 year old mountain guide Moses and head for Nanyuki at the base of Mt Kenya. After an uneventful drive with the obligatory stop at a curio shop, we arrived in Nanyuki where I was told to buy water and wait while a group of 7 Kenyan men fussed over food, money and kerosene. “For every job you create, the person working is supporting at least 8 other people,” he said. Once all the supplies were jammed in the boot, Moses was joined in the backseat by cook Richard and porter John. These 3 guys were going to be my company on our 5-day trek up and over the mountain. 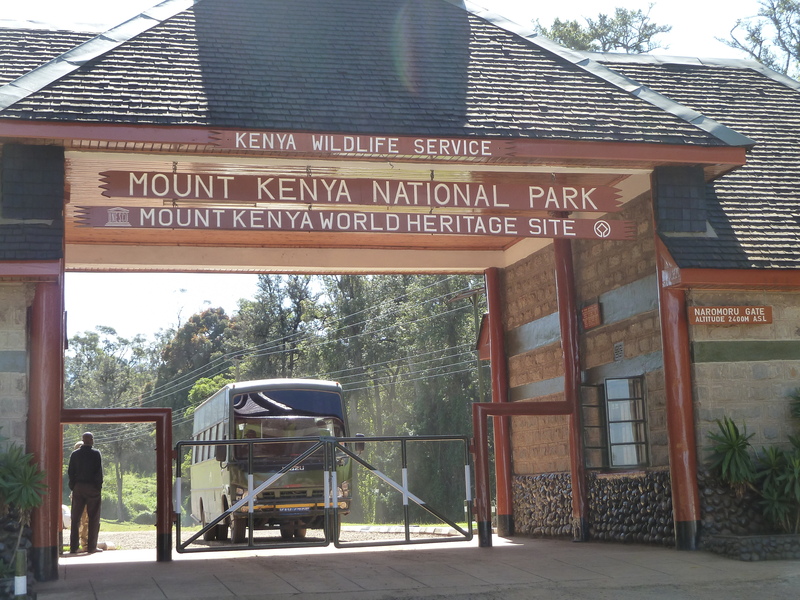 Taking the Sirimon route on the mountain’s north, Moses and I left the Kenya Wildlife Service gate by foot. Me with a daypack and camera, Moses with all his gear. Richard and John had everything else. Much to my chagrin about 20 minutes into the walk Richard and John sped up the hill past us in a 4×4. I should have been pleased I was getting the full walking experience, but instead I went back to counting steps and trying to get more than 500 without needing a break. The incline was steep and we were walking from 2650m to 3300m altitude over 9km. 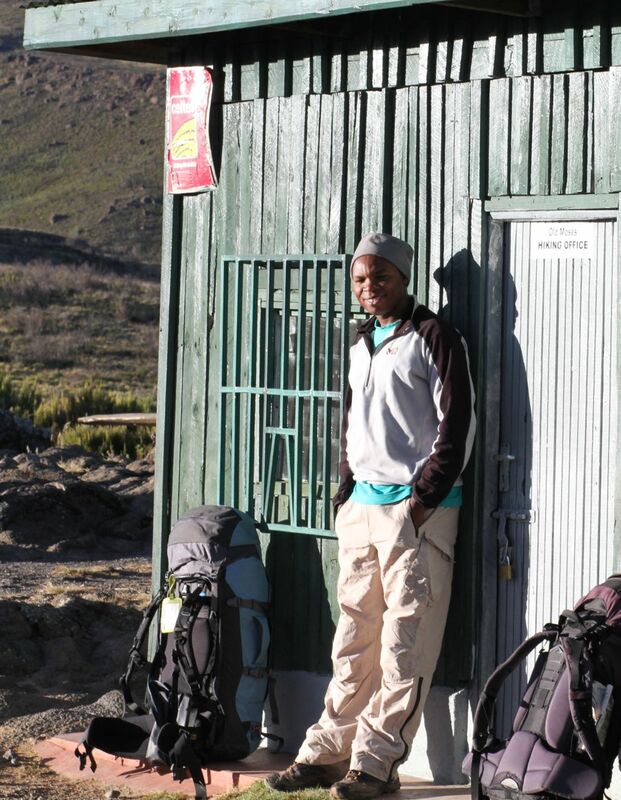 One thing easier about the Mt Kenya climb than what’s ahead for Kilimanjaro is the accommodation. The four nights on the mountain were spent in cabins. On Kilimanjaro I’ll be camping. On my first night at the appropriately named Moses camp I had a room to myself despite there being other groups of trekkers there. The camp can sleep over 100 people – I guess with 10 trekkers and our respective entourages that’s why it didn’t feel crowded. As the only solo trekker I found it easy to make friends. Irish couple Peter and Mary-Jane sat next to me at the communal dining table, and as it turned out their guide was my cook Richard’s brother. “Biological brother, not just African brother,” he reassured me. Meals in the cabins are all prepared and served by the cook and there was no shortage of things to eat. I’d been suffering a stomach that wasn’t being helped by the exercise and altitude so for the first two nights of the climb I was scolded by both Moses and Richard for not finishing my three-course dinners. The second day walking was the longest of the trip at 16km. Following cat tracks and crossing at least 3 icy-cold streams, I kept pace with Peter and Mary-Jane. During our picnic lunch we were entertained by red-winged Spalding’s, mountain mice and alpine chats. They were unperturbed by our presence and keen for crumbs, although the alpine chats preferred Peter’s ham to my bread. The weather was on our side and we stripped down to shorts. By mid-afternoon it was hot. “Can I borrow some of your 30+ [sunscreen], my 15+ isn’t working,” Mary-Jane said to Peter. These ostrich plume's are only found on Mt Kenya... massive! I should have taken Mary-Jane’s advice and used more of my own 30+. At that altitude and walking in direct sun for 9 hours, my legs fried. To make matters worse I ended up with a very unattractive band of white across each kneecap where my strapping tape had been. 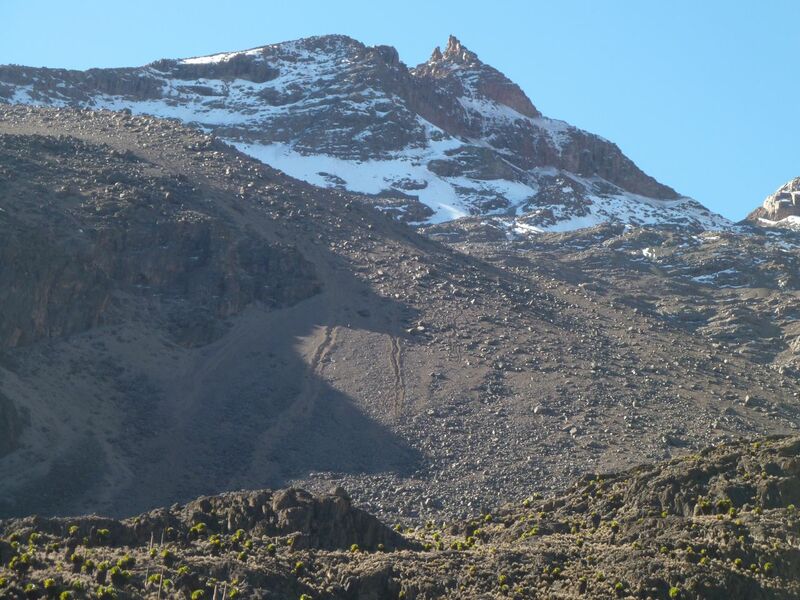 After over 8 hours walking we passed Shipton Caves and Lenana Peak summit came into view. What looked achievable from 25km away now looked near impossible. 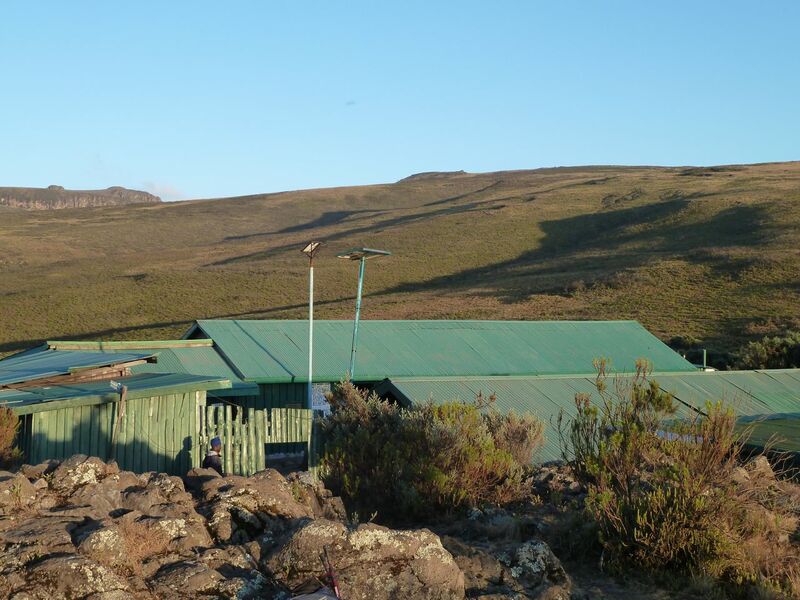 At 4,200m Shipton’s Camp, directly under Mt Kenya’s two highest peaks (Batian and Nelion), we were reunited with the 7 trekkers we’d spent the previous night with. Shipton’s Camp is 6km from Point Lenana, of which about 5km is spent scrambling and puffing up the Harris Tarn scree. The last kilometre is clambering and climbing almost vertically over rocks and boulders on the north face. Choosing not to put my already exhausted body under any more pressure, I decided to approach the summit during the day. I figured I would get my summit sunrise experience at Kilimanjaro and so I took the softer option. The Lonely Planet says a summit attempt from Shipton’s takes between 3.5 and 5 hours. I took exactly 5. It was hard. Each breath was a struggle and I challenged myself to make it 100 steps without a rest. Sometimes Moses made me stop before I got to 100.
altitude everything seems hard and the thought of unscrewing a drink bottle may have just pushed me off the edge. When we finally reached the summit flagpole, Moses took a couple of photos of me and I was horrified at the number of cigarette butts littering the ground. How anyone could smoke after that climb is beyond even this reformed smoker. Descent is meant to be a relief and much easier than climbing. Coming off Mt Kenya this means another 6.5km to the next overnight hut and almost all of it sliding and sidestepping down a scree-bowl. If the rocks had been covered with snow and my boots had been longer and waxed, Moses and I could have carved a great powder-eight and covered the distance in less than a quarter of the time. After almost 10hours walking I was able to sleep despite the altitude. Waking up at 4,300m at Teleki Lodge a family of rock hyrax were playing in the sun and I could look back at what I’d achieved the day before. If it weren’t for the pain in my quads and toes I wouldn’t have believed I’d done it. Once the Point Lenana’s been conquered and the scree bowl survived the only thing I could focus on was a shower and a massage. Unfortunately this was still 2 days away. My fourth night on the mountain was spent at Met Station Camp after a steep 10km down dry creek beds and along giant lobelia covered ridges. This camp was more intimate. 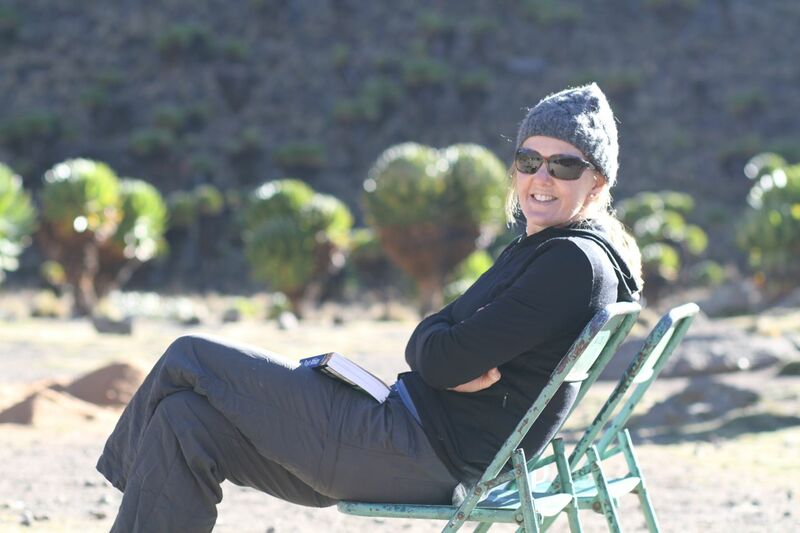 The trekkers I’d started out with had all either spent more time acclimatising or, like Peter and Mary-Jane, had taken the more common Chogoria route down. Kenyan porters. 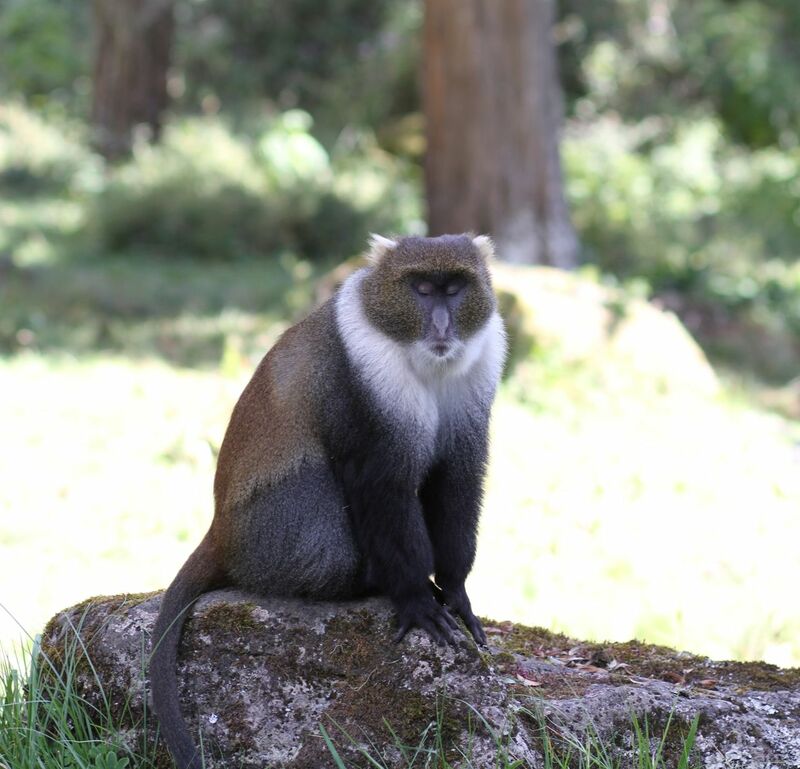 Whist I never felt unsafe, I did lock the hut door… as much to keep the monkeys out, as to help me feel a little more secure. “They asked if we wanted a ride, but I told them we were so close that we would walk,” he said. I walked on in silence but picked up the pace. Less than two hours into the fifth and final day we reached the Naromoru Gate at 2,400m. Lying on the grass, relief, satisfaction and surprise were all fighting to be my most dominant emotion. For Moses, I think it was just relief. He’d more than earned his wage getting me up and over the mountain and his patience with me on summit day I’m sure was the reason I made it at all. Protocol in Kenya is that you give your guide the tip for all the people that supported you and he will divide it appropriately. I’m not sure how my US$150 tip was received – Moses launched into Swahili with the driver and I couldn’t understand anything other than ‘complicated’. 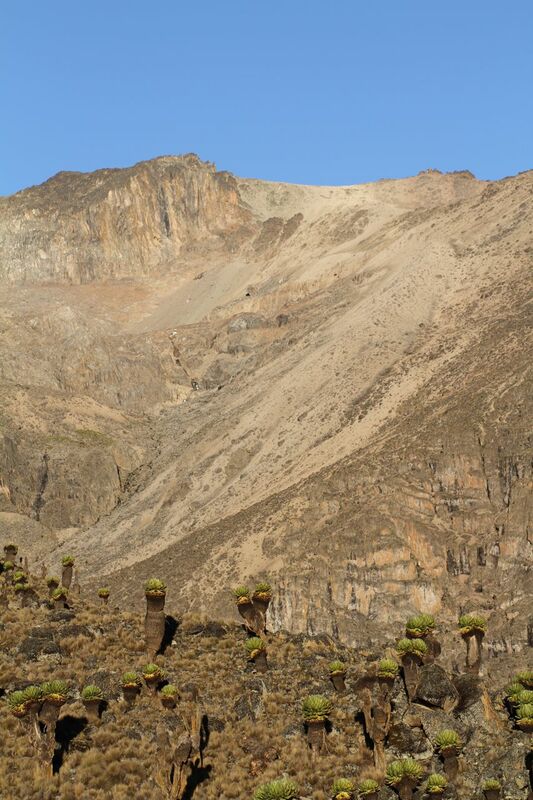 Only around 10,000 people attempt to climb Mt Kenya each year compared with over 25,000 for Mt Kilimanjaro. As a stand-alone experience it this climb was life changing. I spent basically 5 days in the wilderness, away from all family and friends. I pushed myself physically harder than I’ve ever pushed before… and all on my own. when each step felt like a 10km run. 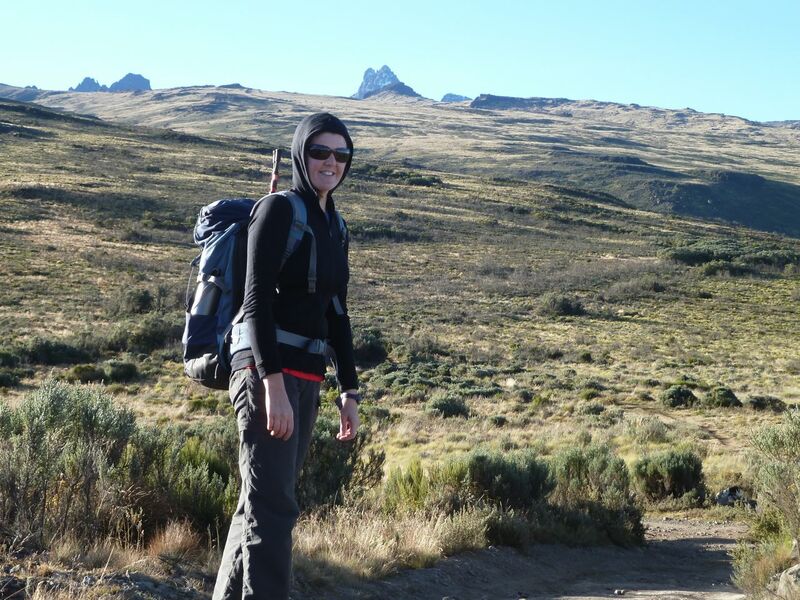 How effective Mt Kenya is as a practice for Mt Kilimanjaro is yet to be tested. But at least for Kili I won’t be doing it on my own, I’ll have a group of Aussies all climbing for a cure helping me up and over whatever rocks and ridges are along the way. This entry was posted in Uncategorized and tagged Africa, hiking, Kenya, mountain climbing, Mt Kenya, Mt Kilimanjaro, Sirimon route, Travel, trekking. Bookmark the permalink. Such a cool trip! And good luck with Kilimanjaro! Glad to hear that your mental fortitude carried you well despite the quads and sunburn! Go JK! Glad to hear your mental fortitude and your quads carried you well despite the sunburn. Go JK!